My internet is still down at home, but here’s a Friday Mystery Object anyway! 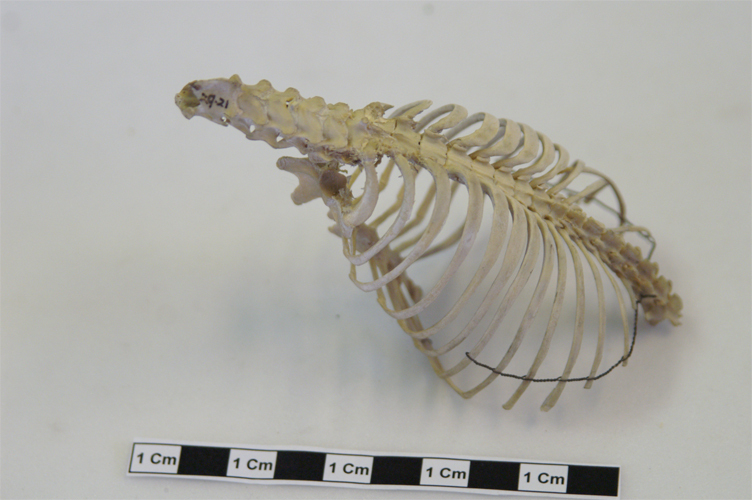 Now you don’t need to be an expert to work this out – just work out how this ribcage is similar to the ribcage of other animals and certain features should start standing out to make the answer obvious – a real case of deductive power! To assist, I will point you in the direction of some useful comparative material and I urge you to consider how function and inheritence both shape bones used in movement. Feel free to ask questions in the comments section below – I will reply whenever possible. I hope you enjoy the detective work! Is the sternum complete? It looks as though it might be missing a few bits from the close up. 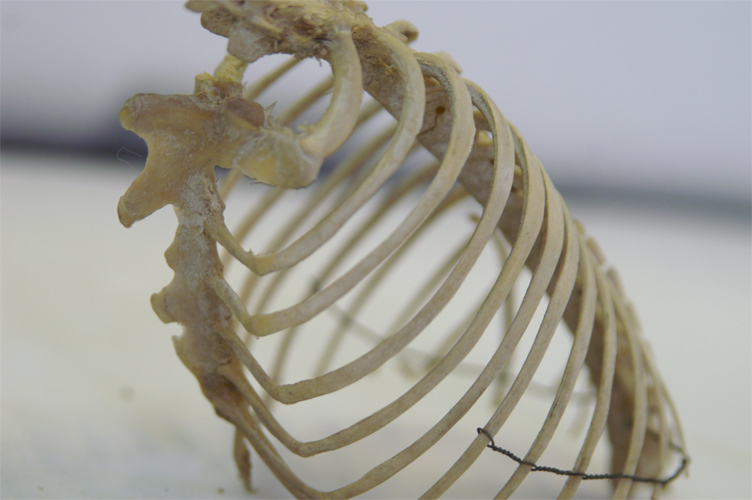 The sternum is large though and protrudes out from the rib cage. Usually this indicates an expansive area for the insertion of pectoral muscles, most often seen in birds. Is that anywhere near? To the best of my knowledge it is complete – good observations about the sternum! Ok, I’m going to go out on a limb here and wing it! (Sorry.) The sternum isn’t really large enough I don’t think for a bird that flies a lot. The rib cage and spine also seem quite upright. I wonder if this is some sort of game bird that spends most of its time ground feeding. Funnily enough, a large sternum is more common in game birds (think of the chicken). The high forces exerted by the muscles in order to take-off are greater for a heavier, shorter winged bird. Take a look at these bird ribs – notice the differences? How about a lizard of some sort? Some good observations, but then the lizard came out of nowhere! Is that a guess or a statement? It is definitely a bat, quite a big one too. It’s only 10cm, I’d say a bird or bat – some kind of flying thing anyway. Unless half of it’s missing, in which case it looks more like a lizard (yes, I’ve been reading up on skeletons). 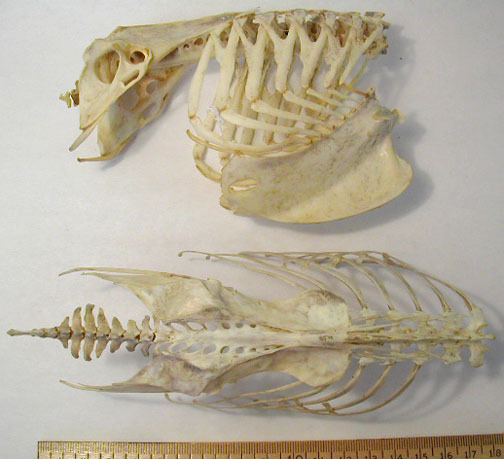 Just googled “bat sternum” and it has the same number of ribs and a similar length. Google is not cheating – it’s part of the process of research! I’m impressed by your rapidly burgeoning knowledge of bones!